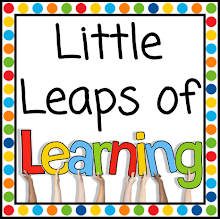 Little Leaps of Learning: NAPLAN? No worries! It's that time of year when there's an editorial on NAPLAN in the newspaper every other day. You may have even seen variations of this letter floating around social media. Walking past newsagents and bookstores, I see the worksheet books of NAPLAN-style tests front and centre. This will not be a blog post debating for or against standardised testing, nor will I be promoting practice tests as preparation. I believe that good, solid teaching all year round is the best and only 'preparation' needed, rather than teaching the test in the month before. Instead, I hope to give you some ideas on how to boost student confidence and ensure your students feel successful while sitting the tests. 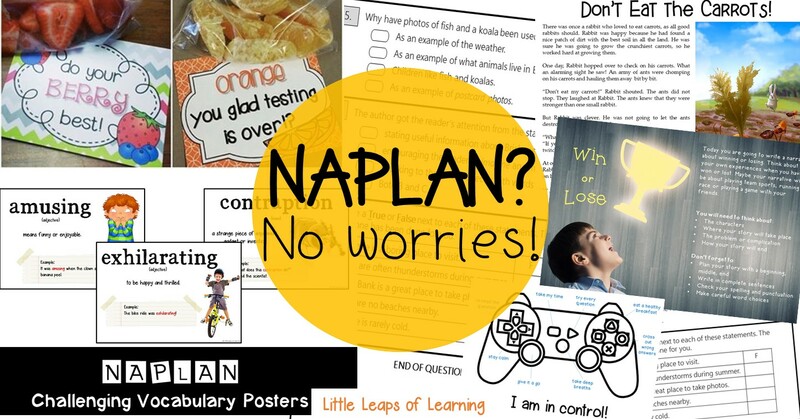 With the time that is left with your class before NAPLAN, I hope you consider the following points and how they might benefit your class. I will definitely be using this idea of a game controller to represent strategies for test success. I cannot find the original author, however I will credit Lauren Gentry for the version I found. 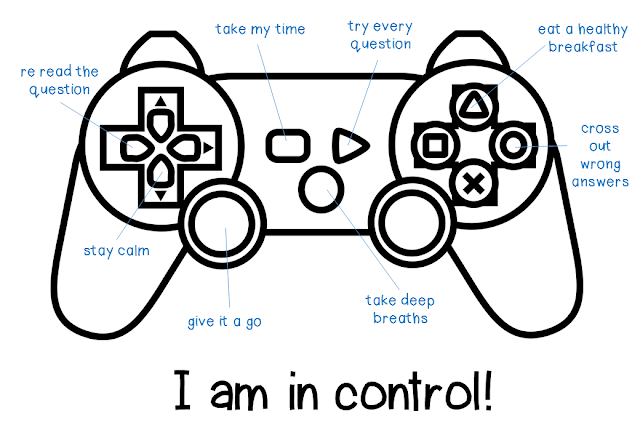 Use the analogy of a game controller for students to see that there are some things about the test that are in their control. I think this is powerful because some of the anxiety can come from fear of the unknown or an external pressure. As a class, brainstorm strategies or things that they themselves can do or think. Students can label the buttons with their favourite strategies. I have uploaded a template for you to download HERE (it is free - but please remember to follow my store to stay updated on other freebies!). It's actually quite a long time for students to remain focused and seated in the one spot. I like to show my students small stretches they can do while they are seated to help them take mini-breaks and to refocus... PLUS how to notice when they need to pause and take a breath (sore hands/neck, hazy head, drifting attention, etc). Stretches with the hands/wrist/fingers and neck are always good, as is 1-3-10 (1 stop, 3 deep breaths, count back from 10). I know from past classes that there is some anxiety with the demand writing task as the genre and topic is unknown. In some years the writing stimulus has not explicitly stated the genre or it was worded strangely... and you never know what they will throw at the students this year! I help my class by telling them they will walk into the room not knowing whether they will be writing a narrative or persuasive text. I tell them that this might feel a bit daunting... and that's okay. I show them how to not panic interpret the stimulus by looking for key words that indicate the genre. It sounds basic but I do feel this is important. Helping students with that very first step when they open the reading task, when they are already feeling nervous, can set them up to feeling more confident. We scaffold so much in writing tasks with graphic organisers, but I also think it is hugely important that students can plan ideas with just a pencil and blank piece of paper. I like to show students some ways to brainstorm and plan without a graphic organiser, but I also like them to experiment and come up with their own that works for them. Some ideas are a concept map, ruling their page into quarters or tracing around their hand to map out story events/reasons. Empowering students to be able to interpret the stimulus, and how to begin organising their thoughts, is huge! I have narrative and persuasive writing prompts, such as the one above, available HERE. I think the difficulty with the reading task is that many students don't revisit the text to correctly answer the questions. Nothing pains me more than seeing a student attempt to answer the questions while the reading magazine paper is closed! You can see the student getting increasingly confused and distressed. Teaching QAR strategies are valuable and I know most teachers are already doing so as part of their reading instruction. I also like to use the analogy of an eagle and wolf. The eagle eye is when we skim the text to find literal information, whereas sometimes we need to act like a wolf to hunt through to find evidence to infer with. Do your students know to reread the text as many times as they need? Do they know how to make notes and annotate? Do they know how to keep the reading magazine open as well as the question paper side-by-side? I have a range of texts and questions/teaching guides, such as the one above, available HERE. 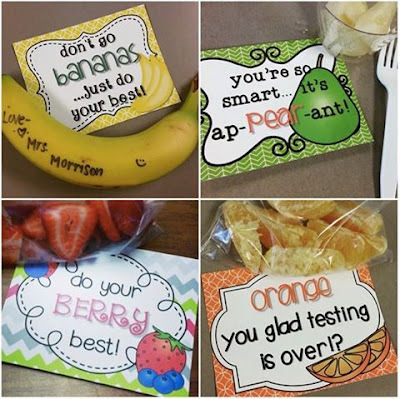 I will be handing out these sweet notes with some fruit during the morning break between the testing sessions. A shout out to O-H So Blessed for allowing me to share this nifty idea with you! These notes can be found here. Lastly, something that my class has really enjoyed has been learning a new word of the day. 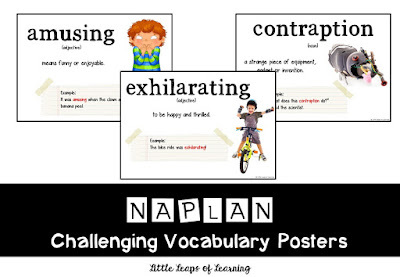 I use these challenging vocabulary posters. These words are classified as 'challenging' if used in the writing task. It has been amazing to see my class gradually incorporate more of these words into their writing and even speaking. If my students use a challenging word in their writing, I allow them to write it in a different colour. 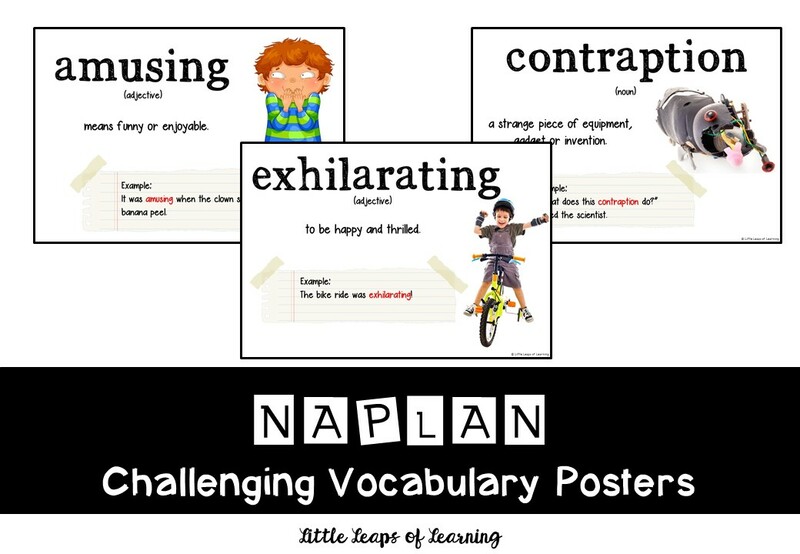 You can find these vocabulary posters here. You are welcome to share this article with your teacher friends by using the share links on the right. Don't forget to follow me on Facebook! Disclaimer: I have no official association with NAPLAN and I am not endorsed to offer official NAPLAN materials or advice. Planning is an important stage in any business and for every person. This is the first thing to do after the appearance of an interesting idea, to make a plan for its implementation. If you do not believe me and the author, I advise you to contact them essay writers. They are professionals in their business and will help everyone who wants to learn something new. On account of an automatic circumstance, TECHNOLOGY UNIVERSITY it is much more imperative to recognize a reason. Well i want to say you here that this is valuable blog, day boarding schools in east delhi where you can get the information about education and ask for any education ! !